Until three years ago, Phean’s family had no access to piped water. In fact, he grew up terrified of drinking water. He knew that as soon as he would have a glass, the pain in the stomach would start. He then would get sick and stay home. He would miss school and playing and sometime his parents would miss work too. “I used to have diarrhea after drinking water”, he confesses. “Since we got piped water in our home, I have not gotten sick, not even once! Now, I bring a bottle of water with me to school every day”, says Soknang. Access to clean water is not common for many Cambodian families. 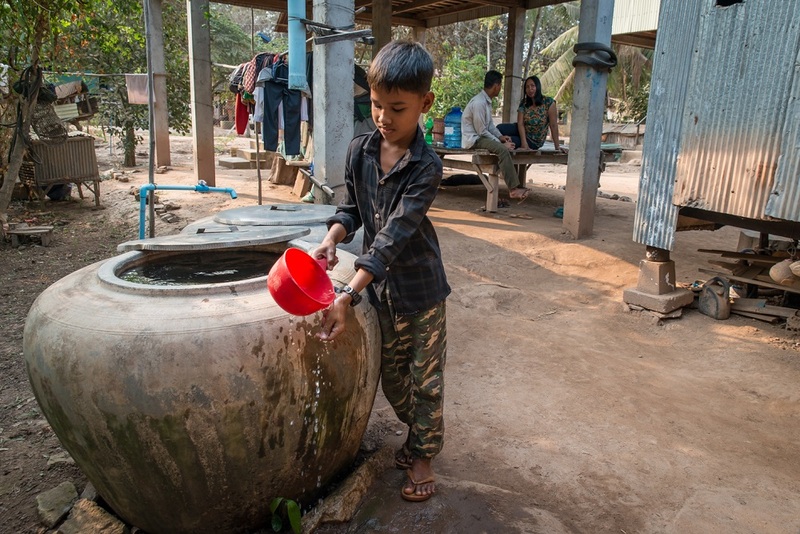 One in three Cambodians uses water from non-improved drinking sources. Disparities are stark between urban and rural areas, richer and poorer households. For example, 40 per cent of rural Cambodians do not have basic hand hygiene facilities, compared to 12 per cent of urban Cambodians, while 81 per cent of the poorest rural Cambodians practise open defecation, compared to 11 per cent of the richest rural Cambodians. Peam Chor is one of the arsenic high-risk districts. Traditionally, people here use water from ponds, rivers, open wells, or borehole wells. These underground sources are often contaminated with arsenic, which is highly toxic in its inorganic form and one of the greatest threats to public health. The immediate symptoms of acute arsenic poisoning include vomiting, abdominal pain and diarrhoea. In the long run, arsenic exposure can cause cancer, diabetes, pulmonary disease, cardiovascular disease and can impact a child’s development. With no access to clean and safe water sources, Soknang’s family was forced to buy water from local water suppliers. “We used to collect water from the river, which is about 200m away. It was very hard to carry. Then we started buying water because we got busy working in the fields. But this was not a solution either. We would spent about 5,000 Reils for two jars (about 1.25 USD per 1,000 litres)”, says Kim Saroeun, Soknang’s mother. 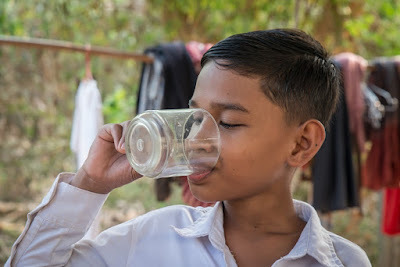 In 2016, UNICEF, with funding support from Aeon and the Japan Committee for UNICEF, partnered with the Government of Cambodia and the Cambodian Water Supply Association (CWA) to find an innovative solution to bring clean, safe, drinking water to Peam Chor. The way it works is simple. UNICEF and CWA support CWA’s private water supply operators to connect piped water to the most marginalized families for the subsidized prize of 20,000 Reils per connection. The rest of the costs are covered by UNICEF and the water supply operator. As a result, 1,371 households including 298 poor and poorest families in the Peam Chor have access to safe water. The programme also has enabled small local businesses to thrive. To Seng You, owner of Peam Chor Water Supply, the benefits are clear. “I can now grow my business and help the community at the same time. I am glad that I can offer some support to the poorest families. It makes me happy to see that everyone has clean water, despite of how poor or rich they are. And I can see how happy people are to have water right in front of their door”, says Seng You. 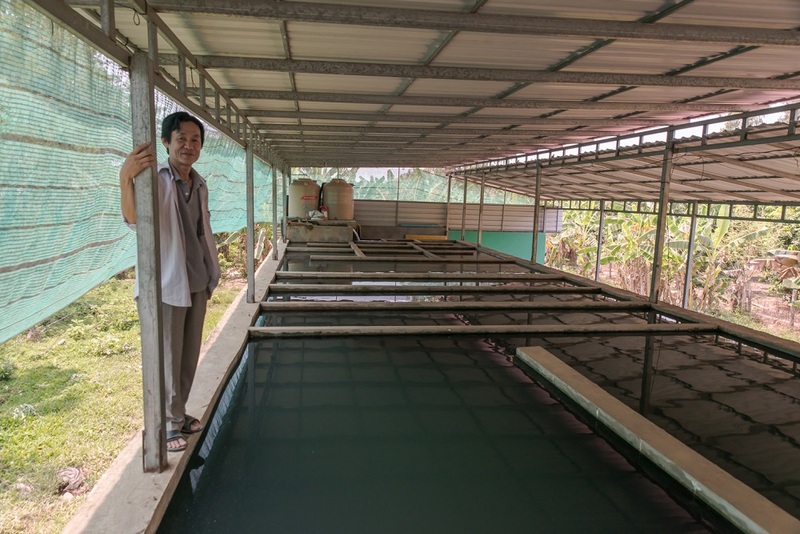 This partnership has allowed Seng You to invest in a second water supply station in Peam Chor to provide water for families that live far away from the commune. A small investment in water translates into a big investment in children’s future. Phean, 10, using water from a reservoir in his home. Soknang is happy to see the water jars are always full. “Now I take two baths a day, one in the morning before going to school and another one before bed. I always clean my hands with soap after using the bathroom”. Soknang's family portrait at their home. Mother: Kim Saroeun, 45 years old father: Pov Phean, 37 years old. As field labors, Soknang’s parents earn a small income. 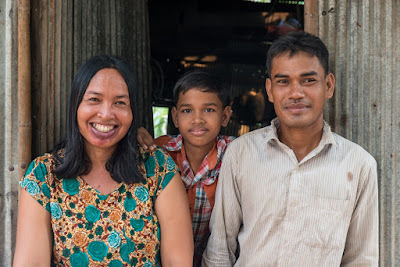 Having clean water at home has allowed them to save some money and cut the health costs as well. “Now we pay about half of the price for the same amount of water – about 5,700 Riels monthly fee for the water utility. Most importantly, we are healthier than before”, says Saroeun. Being healthy and strong, Soknang is dreaming big. “I like the math class the most and I want to be a policeman when I grow up so that I can protect the people in the village”, he says. His mother’s eyes brighten up. “I will do everything to support him to finish high school and achieve his dream”, she says. Seng You, owner of the Water Supply Station in Peam Chor. in Peam Chor District, Prey Veng Province.